Through this marvellous website you can explore in a most pleasant way an indeed short (1967/68), but quite lively period in the history of brazilian popular music called tropicália. The website provides a huge archive of articles, interviews, statements and music related wirh the protagonists of tropicalism like Caetano Veloso, Gilberto Gil, Gal Costa, Tom Zé, the rock band the Mutantes and Rogério Duprat. There are so many deep informations to discover, that here only a few representative aspects can be mentioned. The site contextualizes the tropicalism movement within brazilian history, gives a lively discription of the main happenings, contains a brilliant punctuated chronology comparing the historical happenings with the stages of tropicalism, shows the critical situation between musicians and audience. Further more tropicalia.uol.com.br is designed tastefully colourful and clearly structured. Certainly you can find videos, fotos, audio material, lyrics, discography and bibliography. The site is ment to be a interactive space, where new information, new scientific articles or multimedia material can be posted constantly via comments. 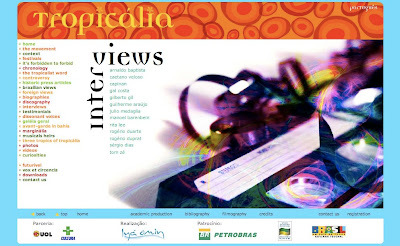 Tropicalia is a project of the brazilian journalist and productor Ana de Oliveira. No Responses to "Website-Review: Tropicalism Movement in Brazil"